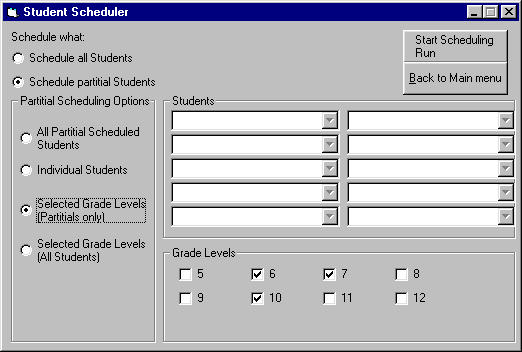 This is the Student Scheduler screen of Solstar 2001. For a description of the buttons please scroll down. The Student Scheduler allows you to create schedules for the students. Unlike the Master Schedule Generator it does not create the classes. This is useful, when you want to try different variations of a schedule. : Creates a schedule for all students. : Schedules those students, who match your selection. : Schedules only those students, who are not fully scheduled. : Schedules the students you selected in the combo boxes. : Schedules those partial scheduled students, who are in the grade levels you selected. : Schedules those students, who are in the grade levels you selected. : Schedules the students matching your selection. : Closes the window and returns to the main menu.